After more than six decades of uninterrupted armed resistance to Burmese rule, the leaders of the Karen National Union (KNU), Burma’s oldest ethnic armed group, have signed a ceasefire agreement with the government. The historic agreement, the first since the KNU began its struggle for Karen autonomy shortly after Burma achieved independence from British colonial rule in 1948, was signed at 2:57 pm on Thursday following talks between a government peace delegation led by Railways Minister Aung Min and KNU representatives led by Gen Mutu Say Poe at the Zwegapin Hotel in the Karen State capital Pa-an. Under the agreement, the two sides will initiate a ceasefire and allow each other to conduct unarmed patrols in their respective territories. The KNU will also be allowed to set up liaison offices in government-controlled areas. According to a local source who asked to remain anonymous, the KNU delegation will travel next to the Mon State capital Moulmein and later visit Pegu, a central Burmese city near Rangoon with a large Karen population, where the KNU is considering opening a liaison office. The KNU representatives arrived in Pa-an on Wednesday, where they were greeted by thousands of Karen people and attended a dinner hosted by the government peace delegation. Several KNU central committee members, including David Taw, Roger Khin, Ah Toe, Aung Maung Aye, Kwe Htoo Win and Brig-Gen Saw Johnny, as well as representatives from all seven KNLA Brigades except Brigade 5, accompanied the peace delegation. Ngwe Soe, who helped to broker the talks, said that both sides agreed to meet again for further discussions. A meeting is tentatitively scheduled to take place in Naypyidaw in 45 days, he added. Despite the unusually upbeat tone coming out of the talks, however, there was still a note of caution in some of the comments coming from those close to the negotiations. Several other ethnic armed groups, including the United Wa State Army, the Shan State Army-South, the Chin National Front and the National Democratic Alliance Army, have also recently reached ceasefire agreements with the government. As a key member of the United Nationalities Federal Council (UNFC), a coalition of ethnic armed groups formed in February 2011, the KNU has called on the government to enter into an inclusive dialogue with all UNFC members to reach a lasting political settlement that addresses ethnic concerns. However, according to a UNFC source, the group has agreed in principle to allow its members to enter into individual ceasefire agreements with the government, on the understanding that this will later lead to political talks involving all of the groups concerned. Founded in 1947, the KNU formed its military wing, the Karen National Liberation Army (KNLA), in 1949 and immediately began an armed insurgency against Burma's central government. Although the group has never signed an official ceasefire agreement with the government, in 2004, the late KNU leader Bo Mya and former government spy chief Khin Nyunt verbally agreed to halt hostilities following talks in Rangoon. However, the fragile informal truce soon broke down. Congratulations to both the parties, Keep up the spirit of brotherhood. After all there is only one race in the world and that is the human race. KNU singed a ceasefire with the right person (civil govt) KIO singed a ceasefire with the wrong person (military Dictator) and KNU sing a ceasefire at the right time ( a lot of things have been changed in Burma) KIO singed a ceasefire at the wrong time ( nothing was changed at that time). KNU started a civil war in Burma so they find the will to end the civil war not only in Karen state but also for the whole country. i believe Karen people are hill people, i'm sure they don't want to enjoy city life. Karen people have been suffered a lot during KIO/KIA enjoy their ceasefire with military dictator.KNU had singed a ceasefire but this is not the end of their story. this is only the first step toward their goal. i believe they will have a lot of thing to solved their problem. 63 years fighting and killing each other don't think that the problem can be solve with one single ceasefire.please think carefully before you judge other. 1. There was only KNDO. KNLA was formed many years later. 2. "[KNU] began an armed insurgency"? This is not helpful. For sure, KNU will tell you the opposite. To be fair and objective, the situation was rather complicated back then. Moves from both side could be misinterprested easily given recent unhappy relations and prevalent situation then. Before Burma gained independence, there were some who warned that things might turn out bad, but it fell on deaf ears. 3. KNU political stand remains unchanged. Don't get confused. Sometimes, it is not just impossible to know the truth. The Karen News is the closet to the KNU leaders and the News Group reported, the KNU did not sign cease-fire agreement but just verbal negotiation. What is going with Irrawaddy? Was that an accident mistake or Dose Irrawaddy has some hidden interest to report this story publicly for a particular group or person interest? Cowards! 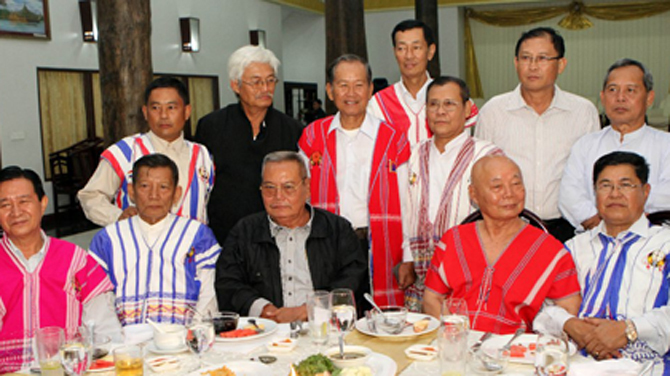 some bunch of rich old KNU general who act like they represent the old karen nation. We are very happy with any peace agreement. Only in peace we can go forward. We are all one race, Myanmars, with variations. Our leader must be very happy that the message is heard and understood by all. Love our ethnic brethren. Protect thier traditions and cultures. they are us, we are them. Welcome back Myanmar Naingngan Taw. How does it translate into English. And the oil made it through. Now UNFC - useless NFC. KIO should kick the current leadership out immediately and face the reality. They should review the current political situation and find a practical solutions with relevant parties. KIO shall not listen the oversea Kachins' voices as they are dreamers. They should be doing for the interest of local people. They crossed the line by defying China & Army, wasted valuable resources. The current leadership will be marked for all the wrong policy and failing to execute a smart political games. No way, Army will give in the current KIO leadership. I hope that they can reach a compromised agreement for the interest of people. Let Dr. Tuja lead KIO once again. He's smart politician. He may find a way out from here. Hope for positive, progressive, sustainable talks and this process will be one of the most tangible achievements in the Burmese History since independence. I think this is a very positive sign that the government can sign a ceasefire agreement with KNU, the longest running insurgency in the world. If other groups genuinely want peace, I don't see why they wouldn't be able to achieve peace as well. Great! The KNU has a ceasefire agreement with the Burmese government! I guess we should all look forward to the arrival of Chinese tourists, their migration to Burma and deflowering Burmese girls. Thanks Jeffee. All you Chinese think about is making money at other people's expense. 100 years down the road, our kids will be reading MYANMAR HISTORY TEXTBOOK "how BAMA has conquered frontier land with just a simple word of mouth." How long will this agreement be honoured by the Burmese government is anyone's guess. I, for one, will still maintain an ounce of skepticism. Should we view the act of Government as an act of good cop to Chin and Karen while it is bad cop for Kachin? Irrawaddy and DVB proudly spread the news that KNU has signed cease-fire agreement...why then krennews.org it self says KNU leaders denies cease-fire agreement....could irrawaddy double check the news??? The Irrawaddy is putting a positive for Aung Min. Quoting only one side, this news is completely misleading. Shame on your lazy journalism. here is the REAL news about ceasefire deal. Myanmar Governmment is almost graduated for handling domestic things themselves. The KNU should realize that signing peace with Burmese govt is a good approach, but the bigger threat still remains: the continue fighting among the Karen factions. We all will need to wait and see how genuine the Burmese government is. We Kachin signed the same sort of agreement seventeen years ago that led to nowhere. Maybe Karens are getting tired of living in the jungle and they want to enjoy the city life. Or KNU military power is getting weak comparing to the Burmese's. KNU should not be part of UNFC because it does not abide by its rules. I hope that they make the decision for the sake of all Karens, not for the leaders of KNU. What is the difference between KNU and UNFC? is that Not federalism? If yes, why Burmese government reject UNFC and instead deal with one by one ethnic? It seams Burmese generals are creating more mess than solving Burma's political problems. How many times are we going to sign peace agreement without the political solution? Sign peaes and delay political talks which never materialize. Khin Nyunt was also very polite and convince all ethnic. But his promise never come to reality. The problem of Burma is delaying political solution. Meanwhile civilians suffer while military generals prolong dictatorships. The KIA is now completely isolated. Only the NMSP speaks out for it. The West continues to pay lip service but will they deliver or just let the Kachin down gently. Too bad, business is business. The govt is definitely on a roll. Foreign govts, east and west, are vying with one another for the Burma, sorry Myanmar, market - cheap labor, natural resources, a dream market for them especially when the global economy is in doldrums. There's a light at the end of their tunnel too even if China fails to consume for the world and lift them out of the slump. An insurance policy no doubt for the planners. It is good sign to sign a cease-fire agreement between government and KNU, the Karen freedom fighter. If government side is genuine ethnic groups should treat vis-vis. Since Karen are fighting one year before Burmese independence, now they are coming to cease-fire is a good sign and shows that in future of Burma will have peace through out country. So now is the time better to stop fighting with KIA and Tatmadaw for the sake of PEACE in Burma as an example. KNU was thinking it would be too late to get a share some sort of business for personal gains and they rushed to Pa-an for ceasefire. Pa Doh AS group who cheated some of his soldiers and there was no followers with him now, DKBA group who helped the army to over run the headquarters Ma-ner-plaw and now disintegrating, PC group, former brd. 7 gone and now abandoned by the government, they all have some sort of business to drain all the resources belong to the Karen people. Sooner or later there will be fighting among the karens for business gains. As for The Karen refugees along the borders, the karens in the third countries it is really a pitiful thing. They will not benefited by the ceasefire. Those who sacrificed their lives for the Karen cause including Pa Doh Mahn Sha will not be benefited by that signing either. Only the enemy will be benefited. Finally, the 63 years war is about to end and tourism to Myanmar's northern states, Shan and Kachin, will soon be booming if the government will relax travel regulations to allow tourists crossing the boarder from Chiang Rai's border to visit those places freely. Due to ethnic conflicts, it was banned in the past but now in time of peace, there is real hope that the government will relax the ban after all the government wants to promote tourism to improve the economy of the people. What is stance of UNFC now? CNF and KNU signs peace? What is UNFC principle? Is not that will negotiate as under one alignment?